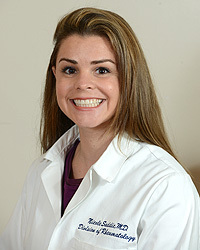 Dr. Thomas is a native of Ellicott City, MD and attended the University of Maryland where she earned her B.S. degree in 2004 with majors in Neurobiology and Physiology. In 2008 she graduated from the Pennsylvania State University College of Medicine in Hershey, Pennsylvania and then completed her Internal Medicine Residency and Rheumatology Fellowship at Georgetown University Hospital in Washington, DC. Dr. Thomas has received multiple scholarships and awards throughout her academic and medical careers, was elected to the Alpha Omega Alpha Honors Society in November, 2008 and was awarded the William P. Argy Teaching Resident Award in 2011. She has coauthored several articles and abstracts, presented research on Systemic Sclerosis at the American College of Rheumatology national meeting in Chicago in November, 2011 and is first author of a manuscript on tuberuculous arthritis that has recently been accepted for publication. Dr. Thomas is Board Certified in Internal Medicine and Rheumatology, and is a member of the American College of Rheumatology. Her areas of interest include systemic lupus erythematosus, rheumatoid arthritis, osteoarthritis and gout. Accepting patients at our Wheaton location.